Rainbow pancakes: because we can. Read also: Pretty Pancakes. This isn’t a recipe so much as it is a friendly suggestion that you should have fun with your food or make these with the coolest child you know. Just tell them you saw this on Spongebob. Did I internet right? If we’re going to just make fancy looking rainbow pancakes, at least let’s make the pancake mix from scratch like a proper adult. Making pancake batter at home is super easy and you likely already have all the ingredients you’d need so no need to ever buy that silly, overpriced mix again. Just focus on getting the real deal maple syrup. You’re gonna like the way you cook–I guarantee it. 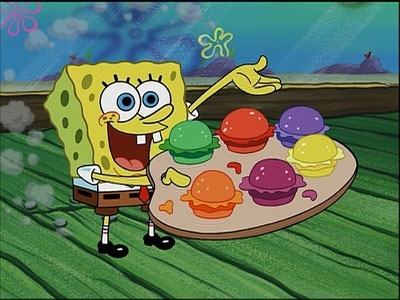 A fun activity, this rainbow pancakes recipe is the funnest. In a large bowl, mix together: flour, baking powder, salt and sugar. In a separate bowl, whisk together eggs and milk, and then pour in melted cooled butter. Gently pour whisked eggs and milk into large bowl of dry ingredients. Mix until flour is moistened. Add extra milk if needed. You will need a looser consistency than your normal pancake to ensure the food coloring mixes evenly. Divide batter evenly into 4-6 separate cups, 1/4-1/2 cup of batter each, and color each cup to the food coloring of your choice. Grease a skillet with a bit of butter and pour quarter cup of pancake into pan. Gently swirl pan to spread pancake to size desired. Flip pancakes after bubbles appear in batter. Keep cooked pancakes in a low heat oven to remain warm. Serve rainbow pancakes with a knob of butter and syrup.